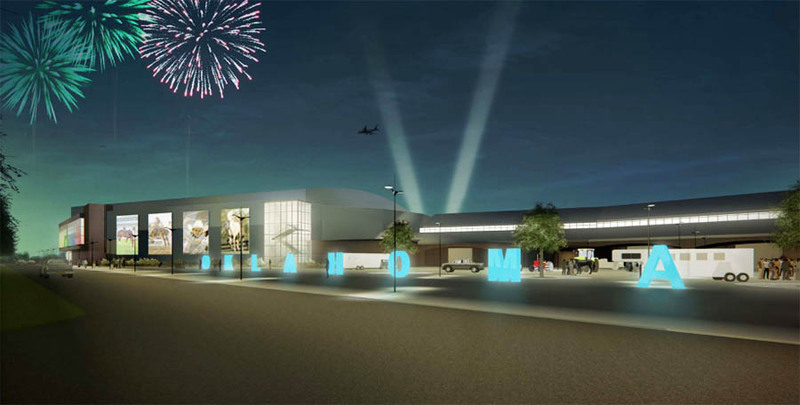 The state fairgrounds board recently commissioned a study by consultants Populous to determine the feasibility of a new 10,000 seat multi-purpose facility on the site of the venerable Jim Norick Arena. 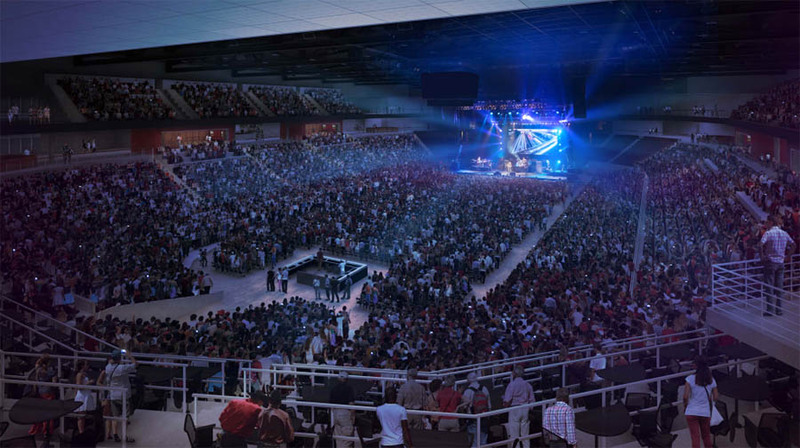 The current arena received a renovation and slight expansion as part of the first MAPS initiative in the 1990's. 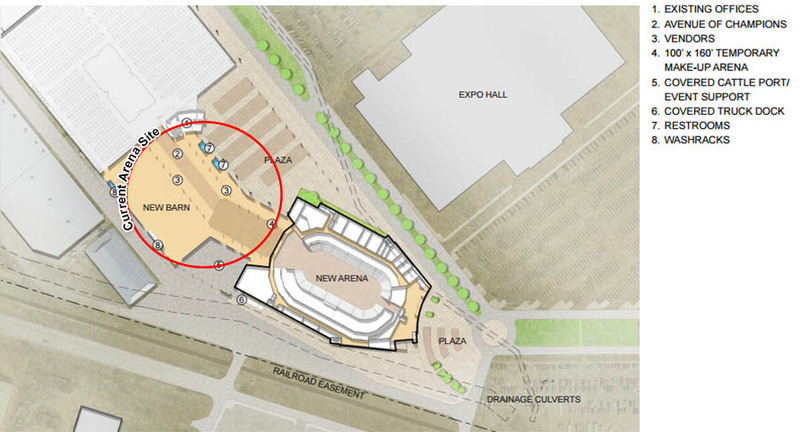 As proposed, the new arena would sit slightly southeast of the present arena site and be completely new from the ground up. It would also be attached to the new livestock barns that were recently added as part of MAPS 2 and directly across from the under-construction Expo Building, which is nearing completion as part of MAPS 3. The preliminary plans also call for a small horse/livestock arena to be built between the existing barns and the new facility, along with more barn and multi-purpose space. 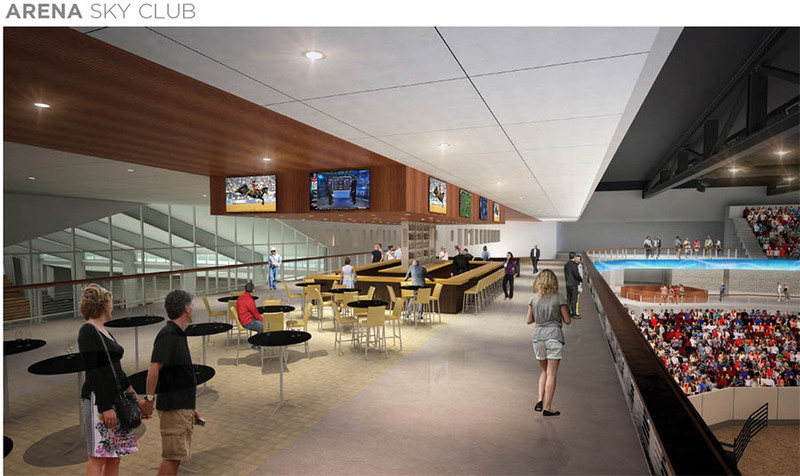 Other features include two large plazas, suites, and retractable upper-level seating. A lounge and restaurants are also part of the proposal. 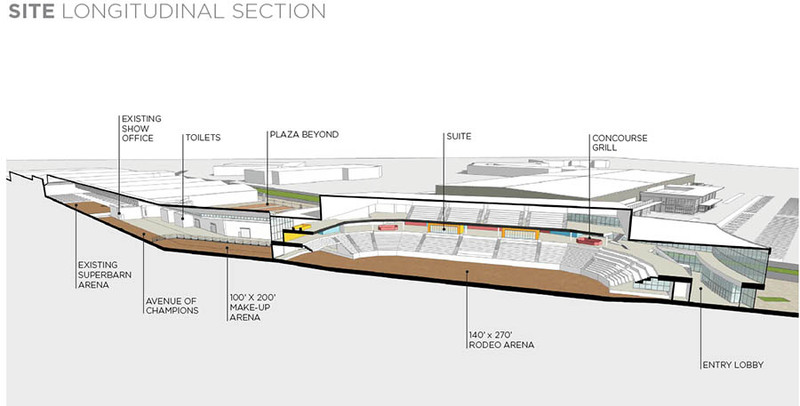 Flexibility would allow for the easy configuration for equestrian/rodeo, basketball, circus, ice shows and concerts. Timeline for construction and costs are not known at this time. I don't see what's wrong with the current arena. The next MAPS or is it just part of regular improvements funded by the hotel tax? They already have a pretty detailed plan when the next MAPS is several years away. I could see them getting this ready for the inevitable tear down of the current cox convention center. Tear down the old state fairgrounds arena while the CCC is still standing and have the new one ready by the time the CCC is ready to be torn down. 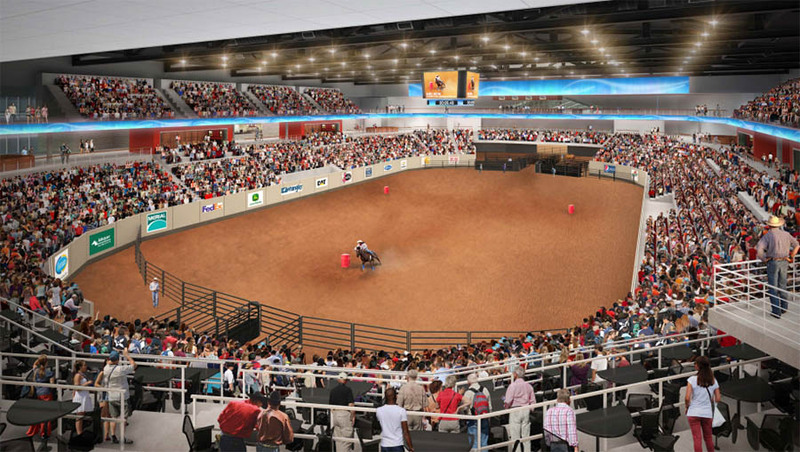 This arena that is being planned looks like its primary designed as a rodeo arena that happens to be able to host other events occasionally. Plus, the current arena was built in the 1960's. Just because it was built in the 60's doesn't mean there's anything wrong with it. 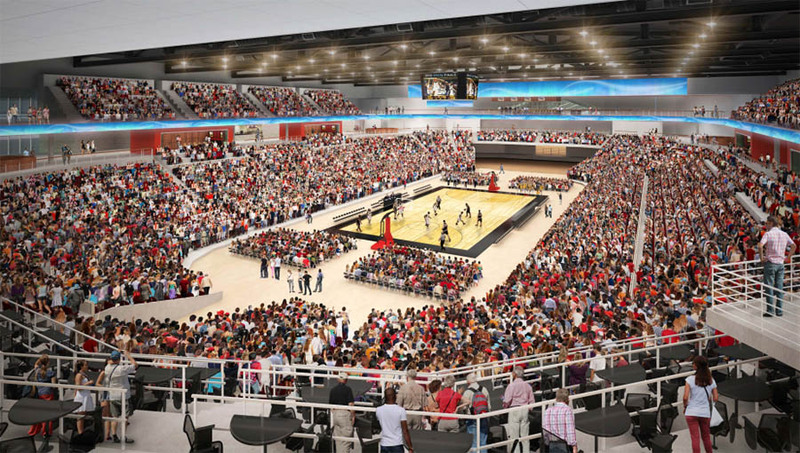 I can't see tearing down a perfectly good 10,000 seat arena just to build another new 10,000 seat arena. Sounds like a complete waste of money to me. Well like the article said, it's an increase up to 10K from 8.5. If you've ever been in there for the OSSAA Basketball games, you can appreciate the need for more seats. I had the opportunity, in high school, to perform at state wrestling there as well (our pep band, aka Basketball band) played during the finals matches. Hey, we thought it was weird but the OSSAA asked us to play, so we said, sure. It was cool and several people from all over the state said they enjoyed it. Anyway....the place did get a facelift, but it really is an old pile still. It looks like complete crap with the exposed foam spray insulation on everything. The locker rooms are pretty sad, and any sort of "green" space just doesn't exist in any practical reality. 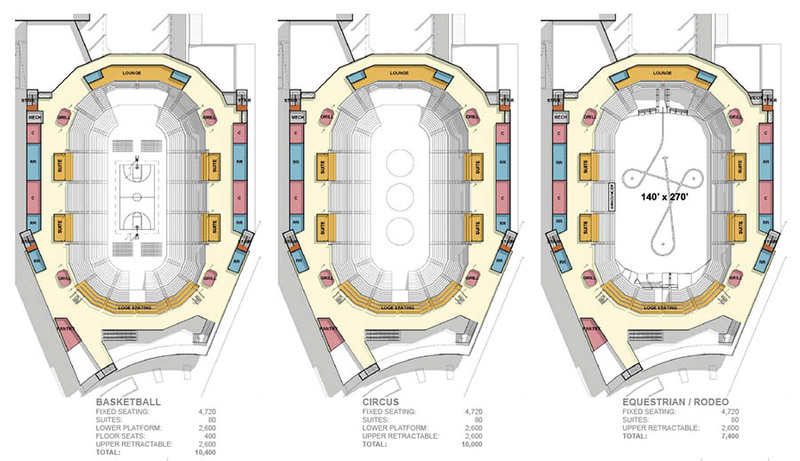 So to compare a new design to that of the current arena is an apples to oranges comparison. Part of this is keeping in mind what the main purpose of the new arena would be compared to the old one. The old one was THE arena in OKC for a while. 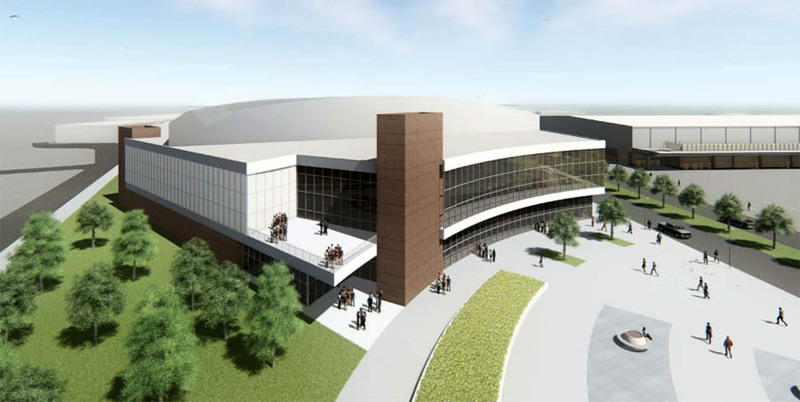 The new arena is meant for ag shows, OSSAA, circus, etc. Think anything that uses dirt...probably going to be here. This is totally separate from the Myriad though. Events held at each are totally different. Heck look at the seating, the upper deck on this one is traditional retractable bleachers!! Obviously this is nicer than the old one, but it's still not a palace. Inclined to agree iwith you here, Patrick. Not seeing the value in the expense, considering that the *primary* purpose for this arena despite its multipurpose persona is to support the horse shows. OSSAA games aren’t going to take up 10,000 seats. I’ve been to the last two 6A basketball championship games, my nephew plays for Mustang, and even the 6A games don’t remotely fill the Mabee center’s 12,000 seats. The arena was well under half full and I don’t think the upper bowl was even opened. I can’t see the small school divisions that play at State Fair coming anywhere close to filling needing 10,000 seats. I'm sure this is all part of the bigger strategy to bring in more equestrian shows. It's not just the arena, but the stage area between it and the existing barns. And, most arenas make their money from suites, food and beverage. This is why cities tear down relatively new arenas like Reunion in Dallas. I admit, I don't know anything about the horse show industry, but I'm sure they expect a certain amount of amenities and perks from an arena like NBA owners do when it comes to their arenas. The State Fair Park's primary goal is to cater to the horse show industry. So no ice rink capabilities? They specifically said ice shows could be accommodated. Nice. I guess I was thinking more along the lines of bringing back some kind of Hockey as well. I was thinking hockey as well, and maybe even making a run at larger rodeos and not just horse shows. I'm sure a hockey rink could be easily accommodated. I've often wondered why there are no hotels right next to the fairgrounds. I assume it is because years ago everyone stayed on Meridian and since it is there is a recurring attendees, this has not changed. I would think the east side of May, which is mostly industrial, would be a good place for a few hotels are restaurants. If your into the equestrian and livestock show business, then this proposal is a no-brainer. If your not then it might seem like a waste of money. Exactly like some people thought the Chesapeake arena renovation was a waste of money. But regardless, there is no way you can keep a dated facility and expect overall revenue goals to grow or even stay the same without upgrades (business 101). 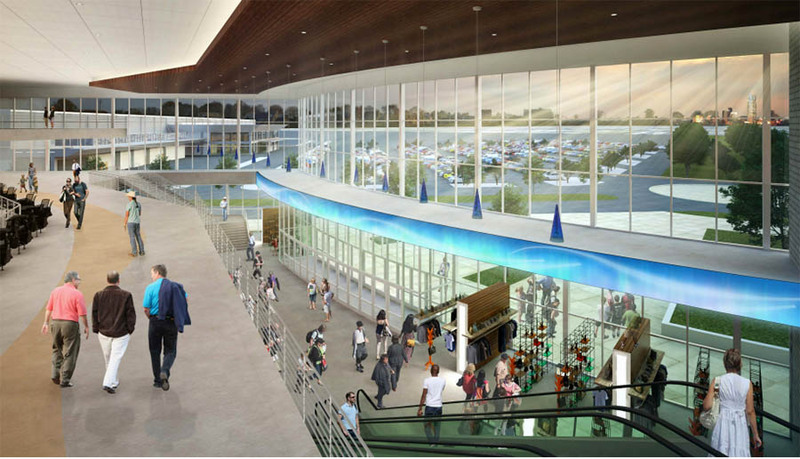 Even if something could be done like in Dallas, where Dart has hotels along the line that runs to the fairgrounds. The lack of a close hotel or public transport has kept me from hosting events at the fairground. Most Fairgrounds improvements are paid for by hotel taxes, as well. So these are people coming in from out of state and it's really them that pay for it. We don't have to tax ourselves to fund the investment like we do with MAPS. And, really, these people also contribute to MAPS when they spend money in the city. So, as opposed to many of the benefits from MAPS projects, the horse shows are largely a pure economic gain for the city and the state. I'm in no way trying to downplay the massive economic benefits of the MAPS projects for the city, but a lot more of that money (not all of it by any means) is spent by people in the metro who would have spent much of that money here to begin with. With the horse shows it's people from all over the world who never would have come to Oklahoma and spent money if not for those shows. If there is any other type of event(s) that bring more people (people with a lot of spending capacity) from out of state and country into Oklahoma, I don't know what it is. And again, since it's largely paid for by visitors, I think it becomes easy to justify it. We get a nice return with little direct investment from the community itself. I don't go to horse shows or could even afford to have horses, but I think it's pretty easy to see that we should be doing as much as we can to maintain and grow the industry in OKC and maximize the revenue it generates through capital improvements like this. @BDP, thanks for that insightful post. My initial reaction to this project was, "why?". Now I'm thinking, "why not?" I suspect with the big civic investment in the barns and now the Expo center, the arena is a big weak link. I used to work at one of the hotels near I-40 & Meridian and that whole area would get overrun when there was something happening at the fairgrounds. Considering the dozens of new hotels in that area, that must be the case now more than ever. I wonder if motorsports shows like Monster Jam and Motocross would hold their events here instead of the Chesapeake. Would make a cool home for minor league hockey, too.